In the 1980"s while attending church back in Dallas,my mother was telling me about the young choir director that was going to be leading them in song.My mother was singing with her church choir in recording a song.Kirk Franklin has it,the enthusiasm,youth,vitality,coolness,that has drawn millions to listen to the message of God's Love.Watch for David Mann aka "Mr.Brown"singing in the duet. Yesterday tragedy hit Chile with a earthquake that mirrored the one previously in Haiti.How often should we pray ?If this does not teach us anything the answer is unceasingly.Let us join in prayer for those in Haiti,and Chile. Going through difficult times,surely God is able and he can get us through. Watch Aretha Franklin ,Billy Preston,and Little Richard testify. "Word Up " Vonda's Vault Box opens up with an attack of Cameosis.. This is well worth the hit enjoy all you Cameomaniacs! Words change and tech changes,EWF asks us to groove tonight.Check out how far videos have come,and now we have started blogging your favorite tunes! Slow it down,only champs allowed,no tramps,no scrubs ! 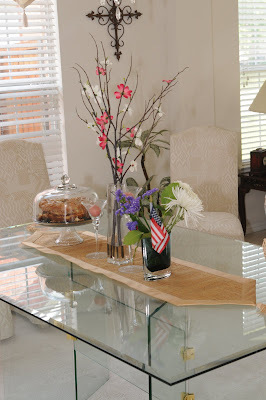 At Vonda's Vault Box we always Remember The Time. Until the next time,we will see you at Vonda's Vault Box ,the home of your back in the day funk-n-roll. I met Richmond Punch several years ago at a event at the African American Museum in Dallas.Richmond is bringing the classics to young people with a interest in playing the violin.Richmond is a trained violinist that has previously studied at Juilliard and Yale.Intrigued,I joked with him that I had only heard of one black violinist and that was"Fiddler" from the movie "Roots". Once you listen to Richmond you will be just as impressed as I am. Richmond also works with other family members who are partners with him in the Punch Family Foundation.Together they are doing their part to bring classical music to the inner city.Years have passed,and I am still amazed,by Richmond and his efforts in helping to introduce the violin to a new generation of music enthuasists. President Obama has called bipartisan political leaders to come together to help reform health care.Is health care dead? Will it be revived ? Perhaps Ron Paul needs to have a voice in this debate .Whether Dems like him or not,when it comes to articulating this subject he might be influential in any true bipartisan agreement. Americans are for the most part satisfied with their doctor, but for those citizens that wait for health care at Parkland Hospital,they say a change has got to come. Now we have the doctors aligned against any change.Why? Because the system enriches them.Change is not profitable for all.In Grand Prairie a large suburb of Dallas, we have hospital beds,but no doctors in a vacant hospital. What's wrong with that? No BIG MONEY in that. Republicans tapping into public anger seizing the moment and any issue.Democrats wishing to carry on the legacy of the New Deal,Fair Deal,and Great Society.Meanwhile because of both parties playing politics ,society is getting the Raw Deal! Whatever happens this Thursday,managed care or mismanaged care.I know one thing for sure.My insurance deductible is to high and my doctor does not do house calls. Where is Marcus Welby when you need him ? 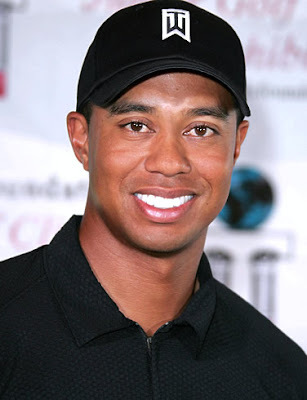 Tiger Woods confessed last week to the American public.I had a conversation with two of my friends yesterday and we came to this conclusion. Tiger does not owe anyone but his wife a apology.The endorsers and the fans that he let down will get over it.I know I have.Life goes on.The Woods story is the story that never stops giving. The apology that he made was a strange event,it looked more like a presidential State of the Union speech. The press and Tiger please let it go. Let us have our time back ! The only confession,that I am really interested in hearing is from Usher. Eric Dickerson is one of my favorite running backs of all time.Perhaps it was his straight up running style,his speed,and grace.It was all of those things and it was also that he was a SMU Mustang! Pony up ! Dickerson ran in the backfield with Craig James in the famed "Pony Express".A interesting footnote was that Dickerson was the back up to Charles Waggoner from Dallas Carter.Dickerson was promoted to start when Waggoner suffered a career ending injury,and the rest is history. 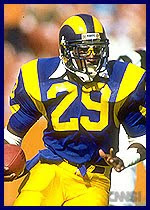 Dickerson played in the the NFL football for the Los Angeles Rams,Indianapolis Colts,Los Angeles Raiders,and the Atlanta Falcons.I can still remember Eric with those googles,and jerri curls,blasting for yards and touchdowns. Dickerson gained 10,000 yards quicker than anyone in NFL History.Dickerson at the time of his retirement was the second leading rusher in NFL history.When Eric hit you,you really felt the pain.Eric Dickerson was placed where he belonged in the NFL Hall of Fame in 1999! The Sunday Morning Gospel feature is taking off.Thanks for your many responses on email,twitter,and facebook.This week we will combine my love for jazz and gospel.One of my favorite Gospel Songs is "Pass Me Not",and Kirk Whalum is my favorite jazz artists.Kirk in "Pass Me Not".I pray that my savior will not pass me by. Recently my wife and I celebrated our wedding anniversary. Love for one another is great,but there is a greater love. Alexander Haig former Secretary of State in the Reagan Administration died today.Haig was a true patriot serving his country in the Korean War and Viet Nam War.In the political arena he was a general in his mannerisms,always commanding, prodding,and seeking to fill power vacuums with authority and order. Originally a protege under Secretary Of State Henry Kissinger in the National Security Council he was appointed by Nixon to be his chief in staff.During this time with Nixon preoccupied with Watergate,Haig ran the White House day to day operations. Haig after the release of damaging Watergate tapes persuaded Nixon to resign. During the Gerald Ford Administration he was the chief of staff where he remained for a short period. During this transition period he persuaded Ford to pardon Nixon.A subsequent return to the military saw him lead NATO as the Supreme Commander a post that he held for the remainder of the Ford Administration. Haig held that position until he resigned in 1979 regarding a dispute with President Carter regarding the Iran Hostage Crisis. Haig's support of Ronald Reagan and a strong military resulted in Haig being appointed the 59th Secretary of State.During this time his comments in the aftermath of the Reagan assassination attempt backfired.His remarks intended to assure,had the opposite affect.Haig's enemies which were legion pounced upon the statement and the widely held perception of Haig as a power grabber cemented his tenure during the Reagan Administration. Alexander Haig and the moments most Americans remember him for. Haig subsequently resigned a year half later.Haig stated the "effort to write my character out of the script was under way with a vengeance. "Haig ran for president in 1988 as a fierce critic of Vice President Bush.Haig assessing his chances dropped out before the New Hampshire primary.Haig later joined the private sector where he joined several prestigious companies on the board of directors or leadership positions.Alexander Haig was 85 years old. Vonda's vault box is emptying and the funk is among us.Requests are coming from all over to keep the funk alive.Ohio sends us a instant message that the Ohio Players was one of the baddest bands back in the day. Remember this jam, it was tight. Funk Knows No Color!The Funk can unite us all,Keep the Funk alive! Vonda's Vault Box continues to be live... All the Way Live ! Back in the day, people could sing! Lets slow it down...They had bands and orchestras!Check out the Luther Vandross Orchestra.This music is Never 2 Much ! Back in the day at the Hilltop at SMU,I took a college course titled Intro to Jazz. became a serious student of jazz one of my college term papers was on the new artist Kirk Whalum. With pen in hand I interviewed him at Fort Worth's Caravan of Dreams and set in one of the rehearsals.I miss the Caravan,it was the best place to hear jazz in DFW.I saw Kirk every time he played in the metroplex.Now Kirk is a well seasoned star, and I still have that long ago signed autograph from him,thanks Kirk for helping me pass the grade. This is vintage Kirk from back in the day. All I Do is bring you the best in Jazz on Jazzy Fridays! The Monday Night Football Treat is in honor of Tim Brown ,without a doubt Tim should be in the Hall of Fame. The Woodrow Wilson "Wildcat" standout is a classact all the way.I met Tim Brown on campus at SMU when he was trying to decide which school he wanted to attend.Unfortunately Tim did not commit to SMU,he went on to play at Notre Dame,where he won the Heisman Trophy. If you have ever met Tim, you know that he is a class act.Tim graduated from Woodrow Wilson High School in Dallas. His teams won a combined total of four games during his time there . Timm brought honor to the school with his winning of the Heisman trophy.Woodrow became the only public school in the country to have two Heisman trophies.The other Heisman belonging to the late Davey O"Brien which was awarded in 1938. Tim Brown's matured from a high school senior to a professional football player. act. 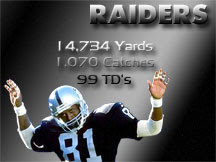 Tim Brown amassed more yards thananyone else with the exception of Jerry Rice , and he ranks as the third leading receiver in NFL history.Tim Brown is our Monday Night Football Hero and he will be in the NFL Hall of Fame.The Hall needs one more classy guy. This is Valentines Day,which is celebrated by lovers around the world on February 14.However , Jesus loves us everyday. This weeks Gospel Treat is the back in the day is sung by Lionel Richie 'Jesus is Love".This is timely today and any day. And what a Happy Day it is to be loved by Jesus as Edwin Hawkins reminds us ! I would like like to thank you for all your numerous phone calls and e mails to Ed Gray for the selection of back in the day music.It was an era when you dresssed up to go to party.If a fight broke out it was a bad thing, instead of saying a party was wack because it did not end by violence. I am having to go back live and Pick Up the Pieces with the Average White Band ! Until next time we will see you at Vonda's Vault Box ,the home of your back in the day funk-n-roll. JazzyFridays are here in Dallas.Dallas has had a vibrant music scene from Deep Ellum in the 1920"s to Stevie Ray Vaughn in blues, to Eryka Badu in neo-soul jazz , to the up and coming artists like Mahogany,Richmond Punch,and Yodchai. Each Friday we will display a artist from the Dallas area as they harness their talents to achieve musical greatness. The first jazz great we will feature will be from Dallas own Lincoln High School.David Fathead Newman achieved success iniatally by playing trumpet in Ray Charles band, and then achieved greatness later own in his own right. David " Fathead "Newman" was an accomplished saxman who knew about"Hard Times" but his sax made us forget them. 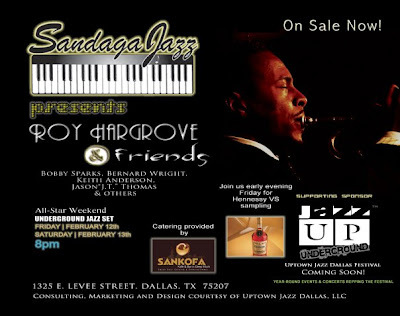 From "Fathead" Newman to the present day jams of Booket T.Washington High School's Roy Hargrove the Dallas sound remains vibrant.Catch Roy and his trumpet at this weekend's Sandaga Jazz promoted by that musical impresario Keith Hill. 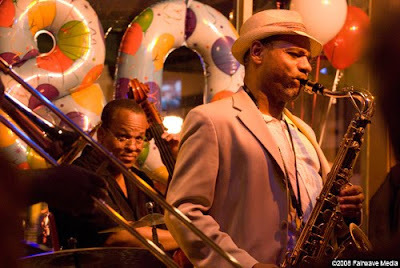 Keith is the founder of Uptown Jazz Dallas Festival International. Back in the day I was a one of the best ballers in the world,okay maybe a neighborhood in Oak Cliff .We all have our hoop dreams and some of us escape the confines of school greatness,neighborhood greatness,and get into the NBA .Dallas has been blessed to have many basketballers from our area, from Micheal Williams a Carter High School standout and long time family friend ,to Spud Webb the legendary mighty mite from Wilmer Hutchins.This video is in tribute to all those who played the game from the back yard legends to the NBA All Stars. I remember all the excitement at Dallas' first NBA All Star game,they played it at Reunion Arena.Our local favorite Spud Webb was introduced to the world.We already knew he was great when he was dunking at Wilmer Hutchins High School. Thats still to amazing,I got to look at from another angle and in Spudd's words. Dennis Rodman was another NBA great was as bad as he wanted to be. Before "Worm" won championships in Detroit and Chicago ,he played ball in south Oak Cliff.He wasn't the best baller in his family,he had two sisters that were ferocious.If the WNBA was created then,they would have been stars.Dennis Rodman was as bad as he wanted to be. From Skyline High School came Grandmama ,who could beat you down. I regret the day we didn'r sign him at SMU. My video blog can not be complete without footage from a guy who challenged me to play basketball.I was in the 11th grade he was still in junior high.I didn't play him because I had high standards,I didn't want to get beat by him. Reputation is everything on the court.My good friend Micheal Williams. Now its a new generation of stars coming to the league like Lincoln High School's Chris Bosh. Chris Bosh now its your time! Whats your Hoop Dream ? 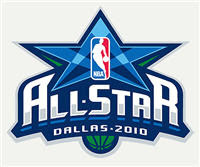 I played mine and they lived theirs ,I am glad their dreams came true.Enjoy the NBA All Star Game ! The Monday Night Football Treat is in honor of the selection of Emmitt Smith to be in the Hall of Fame.I met Emmitt Smith several years ago at a party thrown by that dean of partiers Ron Fry.The party was in honor of Florida A&M Alumni.Go Rattlers! 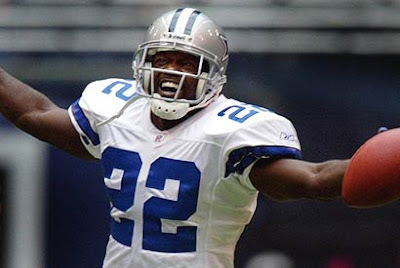 Emmitt at that time was still running the ball for the Cowboys and was in the prime of his career. Ron introduced him to me and I was trying to be cool, like "Hey man ,whats up." We briefly talked about the party and then departed , as he was asked to dance.Ron and myself then commented on Emmitt's dance moves on the floor which were quite good.Who knew years later he would win a national dance contest on t.v. That night he was just another guy,at a party.However there were no other people besides him that were destined for NFL greatness and nationwide acclaim. Congratulations Emmitt on your selection to the NFL Hall of Fame,and thank you for being a guy that had no pretentions to fame. My Sunday Morning Tribute from a favorite of my mother's.I remember hearing this song quite frequently when I asked her for money.Please sit back and enjoy this Sunday Gospel Treat! My friend Vonda has the largest record collection known.She talks about the good old days.When music was real,and the sound was on the one. Check these jams from back in the day! Geofrey Osborne sings the classic LTD song "Love Ballad". Enough of the slow ballad now a little upbeat to get you to move. Guy jams " Groove Me". A trip to the past would not be complete without the Funk!